Sultan Hassan, the Mamluk ruler, built this mosque between 1365 and 1363. He was the grandson of Sultan Qalaun and reached the throne when he was only 13 years old. Sultan Hassan was assassinated shortly after the construction of the mosque. Surprisingly, historians believed that the builders of Sultan Hassan mosque used stones from the Pyramids of Giza. 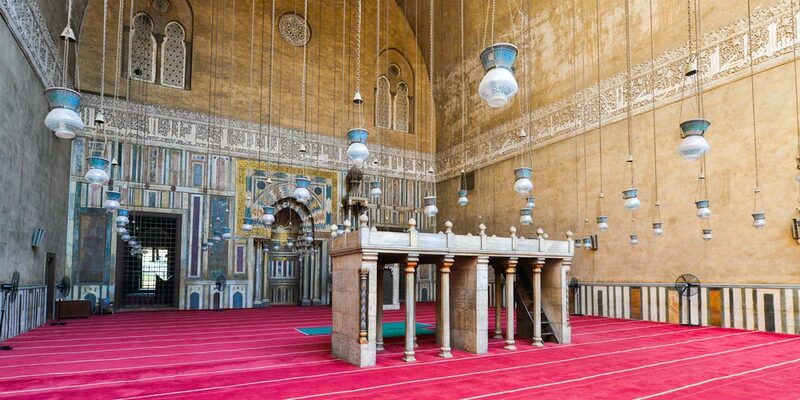 It is considered the finest piece of early Mamluk architecture in Cairo. It is the largest mosque that has ever been built measuring 150m in length and covering an area of 7,906 sqm. Sultan Hasan Madrasa was constructed to include schools for all four of the Sunni doctrines of thought: Shafi’i, Hanbali, Hanafi, and Maliki. It used to house more than four hundred students. 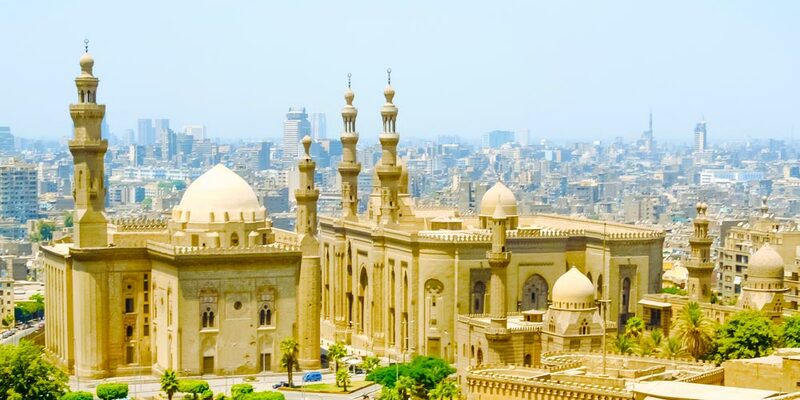 Sultan Hassan mosque is considered one of the famous Egypt’s mosques which tourist visit during their Cairo day tours. Sultan Hassan is the founder of this gigantic mosque. He is the son of Al Nasser Mohamed Ibn Qalawoun. What is astonishing about him is that he ruler Egypt twice, once in 1347 when he was 13 years old and the second time was in 1356 until 1361. His father, El-Nasser Mohamed, was responsible for many monuments including his mosque in the citadel. What was great about the mosque is that Sultan Hassan imported engineers from around the world to build such a historical monument. The location of Sultan Hassan mosque was so important because of its close location to the citadel on the site of the Palace of Yalbugha al-Yahawws. Sultan Hassan ordered Prince Mohamed Ibn Baylik Al-Muhssani to supervise the construction of such an amazing Madrasa in 1361 A.D and the establishment took about 4 years. Suddenly Sultan Hassan disappeared and there was a rumor that he was killed. Then his functionaries, Bashir Al-Gamdar finished the construction. It is believed that the prince and his officials revolted against Sultan Hassan and he escaped from the citadel to Cairo. He was imprisoned and never seen again. He had 10 sons in addition to 6 daughters. There are four iwans in Sultan Hassan mosque and the biggest among them is the qibla iwan. 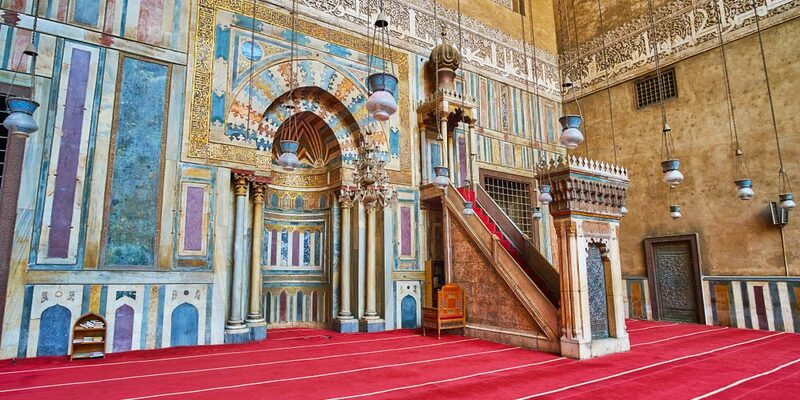 The Minbar of the mosque is covered with colored panels of marble decorated in its upper part by floral motifs. Behind the Mihrab, there is a mausoleum dome, which is about 21 square meters and its decoration is similar to that of the qibla iwan. There was a rumor that Sultan Hassan has been buried in that place. 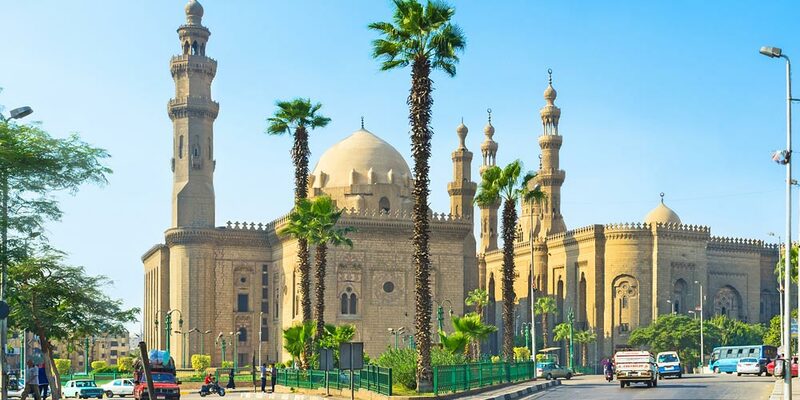 The entrance of the Sultan Hassan mosque is considered the largest portal of any pre-modern Cairene Mosque-Madrasa complex in Egypt. Sultan Hassan intended to build four minarets but only three were built and survived. During the construction work, one of the minarets collapsed and killed a lot of innocents. Sultan Hassan Mosque’s dome that takes the shape of an egg. The location of the mausoleum between the two minarets behind the prayer hall. The Design of the twin Minarets. Sultan Hassan mosque is considered the only instance of Chinoiserie in Mamluk architecture. Finally, don’t forget to check our fabulous Egypt tour packages and book a splendid trip to discover the Islamic, Coptic, and Pharaonic sites in Egypt.